Download the report in Adobe .pdf format. Steven A. Camarota is Director of Research at the Center for Immigration Studies in Washington, D.C. He holds a master’s degree in political science from the University of Pennsylvania and a Ph.D. in public policy analysis from the University of Virginia. Dr. Camarota has testified before Congress and has published widely on the political and economic effects of immigration on the United States. His articles on the impact of immigration have appeared in both academic publications and the popular press including Social Science Quarterly, The Washington Post, The Chicago Tribune, Campaigns and Elections, and National Review. His most recent works published by the Center for Immigration Studies are: Without Coverage: Immigration’s Impact on the Size and Growth of the Population Lacking Health Insurance, Reconsidering Immigrant Entrepreneurship: An Examination of Self-Employment Among Natives and the Foreign-born, and Importing Poverty: Immigration’s Impact on the Size and Growth of the Poor Population in the United States. At their summit in February of this year, the new Presidents of Mexico and the United States promised to work together to create an "orderly framework for migration" between their countries. As a result of the summit, a new high-level working group has been established to study migration between the United States and Mexico. A number of members of Congress have also proposed changes in the laws governing immigration from Mexico, including a new guestworker program for Mexicans, an increase in legal immigration from Mexico, and an amnesty for illegal aliens. Whatever the outcome of these initiatives, policymakers in the United States clearly need up-to-date information in order to weigh the costs and benefits of such programs. Using the latest data available, this report examines the characteristics of the Mexican-born population in the United States in order to shed light on the effect Mexican immigration has on this country and to provide insight into the likely impact of future immigration from Mexico. The report comes to some very troubling conclusions. By increasing the supply of unskilled labor, Mexican immigration has reduced the wages of workers who lack a high school education. This reduction in wages for the unskilled (who are already among the poorest workers in the United States) may reduce prices in the United States by no more than one or two tenths of one percent. The effect is so small because unskilled workers account for only a tiny share of economic output. Thus, even a substantial reduction in their wages cannot generate large benefits for consumers. Moreover, because such a large share of Mexicans are unskilled at a time when the U.S. economy offers limited opportunities to unskilled workers, Mexican immigration has added significantly to the size of the poor and uninsured populations, and to the nation’s welfare case load. Their much lower incomes and resulting lower tax contribution coupled with heavy use of means-tested programs creates very significant fiscal costs for the country. In effect, Mexican immigration acts as a subsidy to businesses that employ unskilled workers — holding down labor costs — while taxpayers pick up the costs of providing services to a much larger poor and low-income population. The Mexican immigrant population is highly concentrated, with 78 percent living in just four states, and nearly half living in California alone. Almost two-thirds of adult Mexican immigrants have not completed high school, compared to less than 10 percent of natives. As a result, the primary effect of Mexican immigration on the U.S. labor force is to increase the supply of unskilled workers — 22 percent of all the high school dropouts in the U.S. labor force were born in Mexico. Since the vast majority of natives have completed high school and are employed in higher skilled occupations, most natives do not face significant job competition from Mexican immigrants. However, there are more than 10 million adult native-born workers who lack a high school education in the U.S. workforce. Consistent with previous research, the results in this study indicate that these less-educated natives face significant job competition from Mexican immigrants. By increasing the supply of unskilled labor, Mexican immigration during the 1990s likely has lowered the wages of workers who lack a high school education by roughly 5 percent. The native-born workers adversely affected by Mexican immigration are already among the poorest in the United States. More than one-fourth of the native-born working poor lack a high school education. Natives without a high school education also comprise a large share of Americans trying to move from welfare to work. There is no evidence to indicate that the United States has a shortage of unskilled workers that needs to be satisfied by immigration from Mexico. The real wages (adjusted for inflation) of high school dropouts who work full-time actually declined 7.2 percent in the 1990s, while the real wages for other workers increased. Also, the number of jobs available for unskilled workers declined by 400,000. Although Mexican immigration is likely to have a significant impact on the wages of unskilled natives, its overall impact on prices in the United States is very modest because unskilled labor accounts for a very small share of economic output. By lowering the wages of unskilled workers, Mexican immigration in the 1990s reduced prices by between 0.08 and 0.2 percent. As a result, immigration from Mexico is almost certainly not an effective tool for holding inflation in check during periods of economic expansion. Because the modern American economy increasingly rewards skilled workers, while offering very limited opportunities to the unskilled, Mexican immigrants experience limited economic mobility in the United States. The average income of Mexican immigrants is less than half that of natives. While their income rises steadily the longer they live in the United States, even long-time Mexican immigrants do not come close to closing the gap with natives. More than half of legal Mexican immigrants who have been in the United States for more than 20 years and their U.S.-born children (under age 18) live in or near poverty (see Figure 1). Even after welfare reform, welfare use among Mexican immigrant households remains much higher than that of natives. An estimated 33.9 percent of households headed by legal Mexican immigrants and 24.9 percent of those headed by illegal Mexican immigrants used at least one major welfare program. In contrast, 14.8 percent of native households used welfare. Moreover, Mexican immigrant welfare use remains much higher than that of natives, even among Mexican immigrants who have lived in the United States for many years (see Figure 1). More than one-half (52.6 percent) of Mexican immigrants do not have health insurance, compared to 13.5 percent of natives, and Mexican immigration by itself accounts for 3.3 million or 29 percent of the growth in the size of the nation’s total uninsured population since 1987. Even among legal Mexican immigrants who have lived in the country for more than 20 years, more than one-third are still uninsured (see Figure 1). By itself, Mexican immigration accounts for 2.9 million or one-third of the national increase in the school-age population since 1982. The impact on public schools in some states has been even larger. Because of their much lower average incomes and resulting lower tax payments, coupled with their heavy use of means-tested programs, Mexican immigrants have a significant negative effect on public coffers. Based on estimates developed by the National Academy of Sciences for immigrants by age and education level at arrival, the estimated life-time net fiscal drain (taxes paid minus services used) for the average adult Mexican immigrant is negative $55,200. The lower educational attainment of Mexican immigrants appears to persist across generations. The high school dropout rates of native-born Mexican-Americans (both second and third generation) are two and a half times that of other natives. As a result, native-born Mexican Americans lag far behind other natives in income, welfare use, and other measures of socio-economic well being. The findings of this report point to two conclusions: First, policy makers in the United States need to consider programs designed to improve the labor market skills of legal Mexican immigrants so that they can better compete in the modern American economy. Second, because Mexican immigration reduces wages for the poorest American workers and imposes significant fiscal costs without generating significant economic benefits, the United States should consider policies designed to reduce unskilled legal and illegal immigration from Mexico and elsewhere. The data for this study come primarily from the March Current Population Survey (CPS) conducted by the Census Bureau.1 The March CPS includes an extra-large sample of Hispanics and is considered the best source for information on persons born outside of the United States — referred to as foreign-born by the Census Bureau, though for the purposes of this report, foreign-born and immigrant are used synonymously. Because all children born in the United States to immigrants (including illegal aliens) are by definition natives, the sole reason for the dramatic increase in the Mexican immigrant population in the United States is new immigration. The issuance of permanent residency visas and the settlement of illegal aliens greatly exceeds deaths and return-migration to Mexico. For this reason the Mexican immigrant population continues to grow very rapidly. In the March 2000 CPS, 850,000 Mexican immigrants indicated that they had entered the country in 1998, 1999, or the first three months of 2000. This means that nearly 400,000 legal and illegal Mexican immigrants now arrive in the United States each year. There are a number of potential reasons why the United States may wish to allow in large numbers of people from Mexico. These include preserving a good relationship with that country, providing an "escape valve" for Mexican workers who cannot find jobs at home, and simple altruism. However, the findings of this study indicate that if policy makers wish to act in the best interests of the United States, then it would make far more sense to reduce both legal unskilled immigration and illegal immigration from Mexico. The available evidence indicates that Mexican immigration reduces wages for the poorest American workers and imposes significant costs on the United States, while generating only very small benefits for consumers. Therefore, allowing in more unskilled workers from Mexico would not be in the best interest of the United States. Rather, it would make more sense to reduce unskilled immigration from both Mexico and elsewhere, while at the same time working to improve the situation for those legal Mexican immigrants and their children already here. The findings in this report indicate that the primary reason for the higher rates of poverty, welfare use, and lack of health insurance coverage — and the large fiscal costs Mexican immigrants impose on taxpayers — is that most Mexican immigrants have little formal education. because the long-term trend of increasing wages for more skilled workers and declining or stagnant wages for the unskilled is likely to continue, the most obvious means to improve the situation for Mexican immigrants already here would be to increase their skills. Our efforts to integrate Mexican immigrants into the economic mainstream should therefore focus on job retraining and other efforts designed to improve the ability of Mexican immigrants to compete in the modern American economy. This would not only improve their economic situation, it would reduce the fiscal costs they impose on other Americans. Related to these efforts, more resources should also be devoted to increasing Mexican immigrants’ familiarity with their new country. This may include public/private partnerships for adult education programs designed to increase knowledge of English and the U.S. job market. Perhaps most important, a greater effort must be made to improve public education in areas of heavy immigrant settlement to ensure that the lower education level of Mexican immigrants does not persist through the generations. Clearly, the success of the millions of Mexican immigrants and children who now live in the United States is important not only to their future but also to the future of the country as a whole. A significant investment in their future would clearly be in the best interests of the country. In most years, more than 90 percent of visas allotted to Mexican immigrants go to the family members of U.S. citizens and non-citizen lawful permanent residents (LPRs). Of course, immigration policy should not be changed in order to reduce Mexican immigration specifically, rather it should be changed to reduce unskilled immigration. Any change must apply to all countries, not just Mexico. By limiting which relatives are eligible for admission, we could reduce the number of immigrants admitted without regard to their skills. The Commission on Immigration Reform chaired by the late Barbra Jordan suggested limiting family immigration to the spouses, minor children, and parents of citizens and the spouses and minor children of LPRs, eliminating the preferences for adult children and siblings. The preference for the spouses and children of non-citizens should also probably be eliminated, since these provisions apply to family members acquired after the alien has received a green card, but before he has become a citizen. If the parents of citizens were also eliminated as a category, family immigration from Mexico would be reduced by more than half to roughly 50,000 or 60,000 a year. Changing legal immigration in this way would significantly reduce the number of legal immigrants admitted in the future without regard to their ability to compete in the modern U.S. economy. Reducing illegal immigration should also be made a much higher national priority. The analysis done here indicates that there are at least three million and perhaps closer to four million illegal aliens from Mexico living in the United States. There are also three to four million illegal aliens from other countries living in the United States. Illegal immigrants from Mexico have added significantly to the size of the poor and uninsured population in the United States and, because they receive benefits on behalf of their native-born children, they have also added to the welfare case load. Among those who study the issue, there is broad agreement that cutting illegal immigrants off from jobs offers the best hope of reducing illegal immigration. Since 1986, it has been unlawful to employ illegal aliens. To date, however, worksite enforcement efforts have been ineffective. There are three steps that are needed to make worksite enforcement more effective. First, a national computerized system that allows employers to verify that persons are legally entitled to work in the United States needs to be implemented. Tests of such systems have generally been well received by employers. Second, the Immigration and Naturalization Service (INS) must significantly increase worksite enforcement efforts. Congress has repeatedly failed to increase funding for worksite enforcement, even though the INS continues to ask for more agents. Third, more could also be done at the border. Despite increases in funding over the last few years, efforts along the southern border remain grossly inadequate. A real effort to control the border with Mexico would require perhaps 20,000 agents and the development of a system of formidable fences and other barriers along those parts of the border used for illegal crossings. The cuts in legal immigration proposed earlier would also go a long way toward reducing illegal immigration in the long run because the current system of legal immigration creates a strong incentive to come illegally. There are approximately four million people qualified for immigration to the United States, but who are waiting their turn to receive the limited number of visas available each year in the various family categories. Such a system encourages those who have been selected, but have to wait, to simply come to the United States and settle illegally in anticipation of the day they are granted visas. Eliminating the sibling and adult children categories would alleviate this situation by doing away with the huge waiting lists. In addition to reducing the incentive to come before a green card is issued, cuts in legal immigration would also be very helpful in controlling illegal immigration because communities of recent immigrants serve as magnets for illegal immigration; providing housing, jobs, and entree to America for illegals from the same country. It is no coincidence that the top immigrant-sending countries are also the top countries in sending illegal immigrants to the United States. Sociological research shows that one of the primary factors influencing a person’s decision to emigrate is whether a family member or member of their community has already come to United States. Thus, allowing in large numbers of legal immigrants is one of the leading causes of large-scale illegal immigration. While some may favor guest worker programs in an effort to have access to immigrant labor without the fiscal costs (guestworkers would be ineligible for welfare), the heavy use of means-tested programs by the families of illegal aliens shows that this is unlikely to work. While illegals are generally barred from using means-tested programs, this has not prevented them from making use of such programs because they typically receive welfare on behalf of their U.S.-born children, who have eligibility like any other native. Moreover, the negative fiscal effects from Mexican immigration are not simply a result of their heavy use of means-tested programs; they are also caused by their much lower incomes and resulting lower tax payments. Because the primary reason for their low incomes is that so many are unskilled, and this fact would not be changed by making them guestworkers, a new guestworker program is likely to impose significant costs on American taxpayers. It is simply not possible to bring in large numbers of unskilled workers — whether they come illegally, as legal immigrants, or as guestworkers — without creating significant fiscal costs. In addition, by increasing the supply of unskilled workers, guestworkers would still adversely effect the wages of natives and immigrants already here working in low-wage, unskilled jobs. And these workers already have the lowest incomes and highest unemployment rates. Finally, it is worth considering that in every country that has attempted to have guestworker programs, it has always resulted in permanent settlement. As one commentator has observed, "there is nothing more permanent than a temporary worker." This report has found that Mexican immigration has added significantly to the size of the poor and uninsured populations, as well as to the welfare case load in the United States. For example, while Mexican immigrants and their children comprise 4.2 percent of the nation’s total population, they comprise 10.2 percent of all persons in poverty and 12.5 percent of those without health insurance. Perhaps most troubling, the findings of this report show that the welfare use, income, and other measures of socio-economic status of legal Mexican immigrants do not converge with natives over time. Their low incomes coupled with heavy use of means-tested programs create very significant fiscal costs as well. While employers may want increased access to unskilled labor from Mexico or elsewhere, this cheap labor comes with a very high cost. The primary reason why Mexican immigrants have not fared well is that a very large share have little formal education at a time when the U.S. labor market increasingly rewards skilled workers while offering very limited opportunities to unskilled workers. The heavy concentration of Mexican immigrants at the bottom of the labor market is also likely to have a significant negative effect on the wages of the more than 10 million unskilled natives who are in direct competition with unskilled immigrants. Consistent with previous research, the results in this study indicate that these less-educated natives face significant job competition from Mexican immigrants. And those native-born workers adversely affected by Mexican immigration are disproportionately native-born minorities and are already among the poorest in the United States. Although reducing the wages for unskilled workers creates benefits for consumers, the size of the benefit is estimated to be extremely small (one to two tenths of one percent) because high school dropouts account for only a tiny fraction of expenses incurred by employers. It is simply not possible for a technology-based economy such as the United States’, in which skilled labor and capital comprise the overwhelming share of economic output, to derive large benefits from unskilled immigration. Despite this fact, those businesses that rely on unskilled labor will likely fight very hard to make sure that there is an abundant supply of such labor in order to keep down their labor costs. Mexican immigration in particular and unskilled immigration in general, in effect, acts as a subsidy for employers who use unskilled low-wage labor. The fact that many Mexican families are dependent on means-tested programs to survive is not something employers take into account. Nonetheless, because it harms the poor and creates significant fiscal costs for taxpayers, policy makers need to consider policies designed to lower the level of unskilled immigration, both legal and illegal. Much greater attention must also be devoted to dealing with the plight of legal Mexican immigrants and their young children already here. At their summit in February of this year, the new presidents of Mexico and the United States promised to work together to create an "orderly framework for migration" between the two countries. As a result, a new high-level working group has been established to study migration between Mexico and the United States. The Mexican government has already indicated its strong desire for an increase in the number of Mexicans allowed to work in the United States legally as well as an amnesty for many or all of the illegal Mexican immigrants now living in the United States. In addition, a number of members of Congress have put forth various proposals, including a new guestworker program for Mexicans, an increase in legal immigration from that country, an amnesty for illegal aliens or some combination of all these proposals.2 Whatever the outcome of these initiatives, policymakers in the United States clearly need up-to-date information in order to weigh the costs and benefits of such programs. Using the latest data available, this report examines the characteristics of the Mexican-born population currently residing in the United States in order to shed light on the effect it has on the country. Perhaps most importantly, by examining the Mexican immigrant population in the United States, this report provides insight into the likely impact of future immigration from Mexico. The data for this report come primarily from the March 2000 Current Population Survey (CPS) collected by the Census Bureau.3 The March CPS includes an extra-large sample of Hispanics and is considered the best source of information on persons born outside of the United States — referred to as foreign-born by the Census Bureau, though for the purposes of this report, foreign-born and immigrant are used synonymously.4 Because all children born in the United States to immigrants (including illegal aliens) are by definition natives, the nation’s immigrant population can only grow through the arrival of new immigrants. The issuance of permanent residency visas, temporary long-term visas, and the settlement of illegal aliens greatly exceeds deaths and return-migration. For this reason, the nation’s Mexican immigrant population continues to grow rapidly. In the March 2000 CPS, 850,000 Mexican immigrants indicated that they had entered the country in 1998, 1999, or the first three months of 2000. This means that almost 400,000 legal and illegal Mexican immigrants now arrive in the United States each year. A Rapidly Growing Population. Partly as a result of reforms in immigration law in the 1960s, the level of immigration has increased dramatically over the last three decades. This influx has caused an enormous growth in the nation’s immigrant population, from less than 10 million in 1970 to more than 28 million today. Mexican immigrants have accounted for a large and growing share of this growth. Figure 2 reports the number of Mexican immigrants living in the country over the last 30 years. Since 1970, the size of the Mexican immigrant population has increased 10-fold, from less than 800,000 to nearly eight million today. The number of immigrants from countries other than Mexico has increased less dramatically, from 8.9 million in 1970 to 20.5 million in 2000. Overall, the growth in the Mexican immigrant population accounts for 37.8 percent of the total increase in the number of immigrants living in the United States. Figure 2 also shows the total fertility rate of women living in Mexico. It is often suggested that declines in fertility in Mexico will lead to a reduction in out-migration from that country since there will be fewer young workers who will need to migrate north in search of employment. However, the historical data do not provide any support for this conclusion. While Mexican fertility has fallen dramatically over the last three decades, the number of Mexicans coming to the United States has increased dramatically. There can be no question that migration is a complex progress affected by many factors, and fertility may be one of those factors. However, the historical data indicate that a reduction in Mexican fertility by itself will not necessarily lead to a reduction in immigration. Without a change in U.S. immigration policy, it seems almost certain that immigration from Mexico will remain at very high levels for several decades even if fertility in that country continues to fall. In addition to asking about country of birth, the Current Population Survey also asks individuals what year they came to the United States. The data show that a large percentage of Mexican immigrants are new arrivals. In 2000, almost three-fourths (73.6 percent) of Mexicans living in the United States had arrived in the country in just the last 20 years. In contrast, of non-Mexican immigrants only 47.4 percent have lived in the country for 20 years or less. Along with Figure 2, the year of arrival data indicate that large-scale immigration from Mexico is a relatively new phenomenon for the United States. Because the Mexican immigrant population has grown more rapidly than the number of immigrants from other countries, Mexican immigrants represent a growing share of the nation’s total foreign-born population. 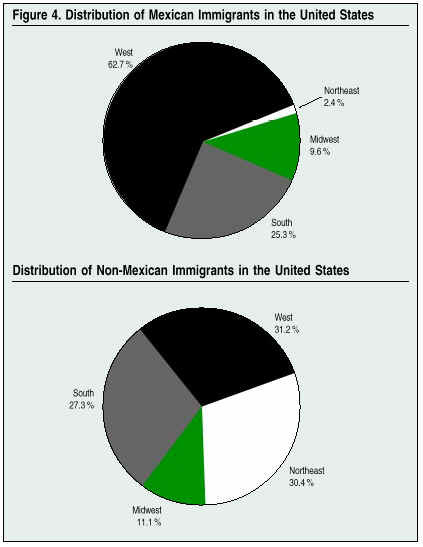 Figure 3 shows Mexican immigrants as a share of all immigrants. In 1970, Mexicans represented less than 8 percent of the foreign-born, but in 2000 they accounted for almost 28 percent. Both in absolute numbers and relative to other immigrants, the Mexican immigrant population has increased enormously over the last three decades. In addition to the rapid increase in numbers, Mexican immigration is highly concentrated. Figure 4 shows the share of Mexican and non-Mexican immigrants living throughout the regions of the United States. With almost 63 percent of Mexican immigrants, the West is the most affected region. In contrast, the figure shows that immigrants from countries other than Mexico are nowhere near as concentrated. The West, South, and Northeast each account for roughly 30 percent of the nation’s non-Mexican immigrant population. The Mexican population is even more concentrated than Figure 3 suggests. Almost half — 48.2 percent, or 3.8 million — of all Mexican immigrants live in just one state: California. Of non-Mexican immigrants, 24.3 percent live in California. In addition, Texas, which is included in the figures for the South, accounts for another 18.5 percent or 1.5 million of all Mexican immigrants living in the United States. Together, Texas, California, and the other two border states of Arizona and New Mexico account for 72.7 percent of Mexicans who have settled in the United States (see Table 1). One of the most important questions surrounding the debate over Mexican immigration to the United States is its impact on the U.S. economy. By holding jobs, Mexican immigrants have a direct and immediate effect on the supply of labor as well as on the goods and services available for consumption within the United States or for export to other countries. One of the most important factors determining the impact of Mexican immigrants on the U.S. economy is their labor market characteristics. Looking at educational attainment is a useful starting point because to a large extent income, what kind of job one holds, and socio-economic status in general are closely tied to educational attainment. This is especially true in recent years. As the U.S. economy has moved to one based on technology and information and away from so called "smoke stack" industries, wages and benefits for unskilled workers have lagged far behind those of more educated workers. Figure 5 reports the education level of adult working-age natives, all immigrants, and Mexican immigrants. The most striking finding in Figure 5 is that a very large share of Mexican immigrants have not completed high school. Working-age Mexican immigrants are more than six times as likely as natives to lack a high school education. Moreover, only a small share of Mexican immigrants have a college or graduate education. Whereas 28 percent of natives have at least a four-year college degree, only 4.4 percent of Mexican immigrants have a college or graduate degree. (Throughout this report persons who lack a high school education are also referred to as dropouts or unskilled workers.) Overall, Figure 5 shows that there is a dramatic difference between the educational attainment of Mexican immigrants and that of the native-born population. As will become increasingly clear in this report, the findings in Figure 5 have profound implications not only for the distribution of Mexican immigrants across occupations and their impact on the U.S. economy, but also for their social mobility, use of means-tested programs, and their effect on public coffers. In terms of its impact on the U.S. labor market, the large number of Mexican immigrants with low education levels means that Mexican immigration has dramatically increased the supply of workers without a high school degree, while increasing other educational categories very little. Figure 6 shows the percentage of each educational category comprised of Mexican immigrants. The Figure shows that immigrants from Mexico account for more than one-fifth of all workers who lack a high school education in the United States. In contrast, they account for only 2.7 percent of workers with only a high school education and less than two percent of workers with some college. For workers with a bachelor’s degree or higher, Mexican immigrants represent less than one percent of all those in these higher-skilled categories. Based on the March 2000 CPS, which asks about employment in the previous calender year, there were almost three million Mexicans working full time for at least part of 1999 who had not completed high school. Basic economic theory predicts that an increase in the supply of something, in this case unskilled labor, reduces the price that the commodity commands in the market. The increase in the number of high school dropouts caused by Mexican immigration indicates that the primary impact of current and almost certainly future Mexican immigration will be on the price of unskilled labor. That is, by increasing the supply of dropouts, Mexican immigration lowers the wages, benefits, and job opportunities for natives and other immigrants with little education. Its effect on more educated workers will be minimal. Therefore, Mexican immigration makes sense to the extent that policy makers determine that the U.S. economy needs more high school dropouts and to the extent that lowering the compensation packages these workers receive is desirable. Table 2 shows the distribution of Mexican immigrants across occupations.5 Turning to the figures for all Mexicans first, Table 2 shows that Mexican immigrants tend to be employed in non-private household service occupations such as janitor, security guard, and child care worker. A large share of Mexicans are also employed as farm laborers and as operators, fabricators, and non-agriculture laborers. Only 5.5 percent of all Mexican immigrants are employed in managerial and professional jobs. Given the lower educational attainment of many Mexican immigrants, the results in Table 2 are not surprising. Commensurate with their education levels, immigrants from Mexico tend to be concentrated in lower-skilled, lower-paying occupations. For example, the average annual wages for managerial and professional jobs is almost $50,000 a year, whereas the average wages are less than half that amount for those who are operators, fabricators, and laborers or workers in non-private household service occupations. A significant percentage of Mexican immigrants live in the United States without authorization. While a large portion of illegals are likely missed by the CPS, perhaps 80 percent are included in this data. It is possible, based Immigration and Nationalization Service (INS) arrival data for legal immigrants and demographic characteristics, to identify persons included in the CPS who have a high probably of being in the country illegally. It is likely that of the 7.9 million foreign-born persons from Mexico in the March 2000 CPS, between 2.5 million and 3.5 million are in the country illegally. Based on year of entry, citizenship status, age, educational attainment, welfare use, and citizenship of spouse, I estimate that the size of the Mexican illegal population in the March 2000 CPS is 2.96 million.6 These results are consistent with estimates made by the INS7 and indicate that nearly 38 percent of the Mexican-born population in the CPS are in the country illegally. Of course, it should be noted that different assumptions about the attributes of illegals will yield different results. By its very nature, estimating the size and characteristics of the illegal Mexican population in the CPS involves a good deal of uncertainty. The above estimates and those that follow from it should not be seen as quantifiable absolutes but rather should be used to provide insight into the relative differences between legal and illegal Mexican immigrants. It is also important to realize that the above figures are only for illegal Mexicans included in the CPS. The total illegal population from Mexico is almost certainly larger. Assuming that the CPS includes 80 percent of the illegal Mexicans, then the total size of the illegal Mexican population residing in the United States in 2000 was perhaps 3.7 million. The figures in Table 2 for legal and illegal Mexican immigrants are based on the above method of distinguishing between the two groups. The table shows that there are some differences in the kinds of occupations legal and illegal Mexican immigrants hold in the United States. Almost 18 percent of illegal Mexican immigrants are employed as agricultural laborers, in contrast to only about 10 percent of legal Mexican immigrants. The table also shows that contrary to the popular impression, more than 80 percent of illegal Mexican immigrants work outside of the agriculture sector. Most illegal immigrants work in non-private household service occupations, precision production craft occupations or as operators, fabricators, and laborers. The same is true for legal Mexican immigrants. Both groups are overwhelmingly concentrated in lower-paying, less-skilled occupations. However, in contrast to illegals, a significant percentage of legal Mexican immigrants work in managerial and professional or technical sales and administrative support occupations. One out of four legal Mexican immigrants was employed in these higher skilled occupations, compared to only 6 percent of illegal aliens. Of course, compared to the 60 percent of natives who work in higher-skilled occupations, relatively few Mexican immigrants, legal or illegal, are employed in higher-paying professions. In addition to the kind of jobs they hold, the impact of Mexican immigration on the United States is also dependent on their employment by industry. Table 3 shows the distribution of Mexican immigrants across industries. The table shows that Mexicans are concentrated in the retail, agriculture, and manufacturing sectors of the economy, with 56 percent employed in these industries. In comparison, only one-third of natives work in these industries. Also in contrast to natives, relatively few Mexican immigrants work in the public sector or are employed in professional services industries (such as doctors’ offices, law offices, accounting, and engineering), whereas 29 percent of natives work in these areas. Table 3 also shows the distribution of legal and illegal Mexican immigrants across occupations. The table reveals some important differences between the two groups, but also a good deal of similarity. The primary difference is that illegal Mexican immigrants are more concentrated in agriculture and construction. Also, relatively few illegal aliens work in professional services. Overall, however, the two groups are much more similar to each other than they are to natives, with almost two-thirds of both working in manufacturing, construction, agriculture, and retail. In contrast, only about 40 percent of native-born workers are employed in these industries. As indicated by Figure 6 (page 20), Mexican immigration has significantly increased the supply of workers who lack a high school education, while having a very small effect on the supply of workers in other educational categories. As a result, the primary effect of Mexican immigration will be on unskilled native-born workers. An often-made argument for Mexican immigration is that it holds down labor costs for employers who use unskilled labor. Employers in turn pass the savings on to customers resulting in a reduction in prices. Thus, any reduction in wages for the unskilled should lower prices in the United States for things such as produce, child care, and other goods and services in which unskilled labor is an important input. Of course, if Mexican immigration does not reduce wages for unskilled workers, then there is no benefit. In other words, if wage costs for employers are the same with or without Mexican immigrant labor, then there is no savings to be passed on to consumers. The often-made assertion that immigrants only take jobs Americans do not want is partly correct, at least in regard to Mexican immigrants. It seems very likely that the vast majority of the jobs held by Mexican immigrants are jobs that would not interest the majority of Americans because they are generally low paying work done by unskilled workers. However, it is also clear that there are millions of Americans who do precisely those kinds of jobs. There are 8.3 million native-born workers 18 years of age or older working full-time who have not completed high school. In addition, there are 3.4 million adult native-born Americans who lack a high school education working part-time. There is a good deal of evidence that these workers are in direct competition with Mexican immigrants. Table 4 reports the distribution across occupations of full-time native workers who lack a high school education and full-time Mexican immigrants. The table indicates that with the exception of agricultural labor, the two groups have similar distributions across occupations. Thus, natives who lack a high school education and Mexican immigrants appear to be doing the same kind of jobs and are therefore in competition with one another. Another way to think about whether Mexican immigrants compete with unskilled native-born workers is to look at their median wages. If Mexican immigrants were employed in jobs that offered a very different level of remuneration than native-born dropouts, then it would imply that the two groups do very different kinds of work. But in fact the median wages of Mexican immigrants and native-born high school dropouts are very similar. The median weekly wage for native-born high school dropouts who work full time is $350, while the median weekly wage for full-time Mexican immigrants is $326. Like their distribution across occupations, the wages of the two groups seem to indicate that they hold similar jobs. The Bureau of Labor Statistics study cited above found that, between 1980 and 1990, half of the decline in the wages for high school dropouts in the 50 largest cities was attributable to immigration. In their paper for Brookings, Borjas, Freeman, and Katz estimated that the wages of high school dropouts are about 5 percent lower because of immigration and that immigration accounted for about 44 percent of the decline in wages for dropouts relative to other workers between 1980 and 1994. A study of California done by RAND found that immigration in that state had an adverse impact on the employment opportunities for unskilled natives in the 1980s.11 In a comparison across cities, Cordelia Reimers found that the impact of immigration falls heaviest on African-American and white high school dropouts.12 Other research has come to a similar conclusion.13 Because immigration in general and Mexican immigration in particular increases the supply of high school dropouts, it should come as no surprise that it reduces wages for unskilled workers. Of course, any reduction in wages for unskilled workers does not vanish into thin air. Some or all of it should be passed on to consumers in the form of lower prices. The size of the impact on dropouts. Although previous research indicates that unskilled immigration reduces wages, there is some debate about the size of the wage effects of immigration on unskilled workers. Therefore, Column 2 in Table 5 reports three different assumptions about the elasticity of wages for unskilled workers. That is, it provides three different assumptions about the size of the wage response for each one-percent increase in the supply of unskilled labor. Column 3 reports the total impact of Mexican immigration on labor incomes for unskilled workers by multiplying the elasticity assumptions in Column 2 by the total increase in the supply of unskilled labor found in column 1. Column 3 indicates that the total reduction in wages for dropouts is likely to range from -3.2 to -8.1 percent. While this is a wide range, the most likely impact is probably found in the middle range value of -5.4 percent. Thus, Mexican immigration in just the 1990s is likely to have had a significant impact on the wages of high school dropout workers in the United States. Percentage of economic output accounted for by dropouts. Based on the March 2000 CPS, I estimate that full-time high school dropouts account for 3.72 percent (Column 4) of total cost to employers.15 This is based on the assumption that in addition to labor, capital accounts for 30 percent and skilled labor accounts for 66.28 percent of employer costs. This estimate is consistent with previous research, which has attempted to measure unskilled labor as a share of the economy.16 The percentage of economic output accounted for by dropouts is so small because their earnings are so much lower than that of other workers and because dropouts account for only about 10 percent of the total workforce. Column 5 reports the total savings to employers from Mexican-induced reductions in the prices of unskilled labor. The middle range value indicates that 1990s Mexican immigration is likely to have reduced costs for employers by 0.2 percent. The percentage of savings passed on to consumers. At present there is no research to indicate what share of immigrant-induced reductions in labor costs are passed on to consumers. In a perfectly competitive market, competition should force firms to pass on all of the savings to consumers. But in the real world there are always some obstacles to perfect competition and thus it is almost certain that some of the savings will not be passed on. Therefore, Columns 6, 7, and 8 report the effect on prices based on the assumption that businesses pass on 33, 66, or 100 percent of the saving to their customers. Concentrating again on the middle-range value, and assuming that two-thirds of the savings are passed on to consumers, the total impact of Mexican immigration on prices in the United States is estimated at 0.13 percent. But even assuming that the impact on wages is larger and even assuming that all of the savings makes its way to consumers, Mexican immigration in the 1990s could only reduce prices by three tenths of one percent. The findings in Table 5 indicate that while the impact of Mexican immigration on the wages of unskilled workers in the 1990s may have been significant, the overall effect on prices in the United States must be very small. Therefore, it is unlikely that Mexican immigration is an effective tool for holding wage inflation in check during periods of economic expansion. This is true even if the decline in wages for unskilled workers is substantial and even assuming that a large share of those savings gets passed on to consumers. Moreover, the above analysis probably overstates the impact of Mexican immigration on prices in the United States because it ignores the very real possibility that imports would increase in the absence of Mexican immigration. As already discussed, a large share of Mexicans are employed in manufacturing and agriculture, two sectors of the economy in which import penetration is already very significant. Thus, a reduction in immigration might have been mostly or entirely offset by increased trade. It should also be noted that Table 5 uses a relatively short time horizon and that this tends to reduce the size of the measured impact. The overall effect on wages using a longer time period, say post-1979 rather than post-1989, would increase the impact of Mexican immigration on prices because there are more post-1979 immigrants in the work force than post-1989 immigrants alone. On the other hand, the longer the time horizon, the more likely that capital substitution would take place and thereby reduce the impact on prices. That is, in the long run employers would likely increase the productivity of their workers by purchasing labor-saving equipment in order to mitigate some of the costs of having to pay workers higher wages. Thus, while Table 5 assumes that capital stocks are fixed, this would make less sense over a longer time period. It may be surprising that the millions of Mexicans holding jobs in the United States have such a small impact on the overall U.S. economy. To understand why the effect of Mexicans must be very small, it may be helpful to examine what share of total economic output Mexican immigrants account for. Based on the March 2000 CPS, which asked about employment in the previous calendar year, there were a total of 4.9 million Mexican immigrants working in the United States for at least part of 1999 — out of a total U.S. workforce of 149 million. This means that Mexican immigrants accounted for 3.3 percent of the total workforce. Of these, 4.4 million worked full time out of a total full-time workforce of 119.2 million, and 500,000 worked part time out of a total part-time workforce of 29.8 million. Mexican immigrants therefore accounted for 3.7 percent of all full-time workers and 0.4 percent of all part-time workers. Despite the fact that they account for 3.3 percent of the U.S. workforce, Mexican immigrants’ total earnings account for only 1.91 percent of all labor income (including, salary, wages, commissions, tips, etc.) paid to workers in the United States because of their lower skill levels and resulting lower average incomes. This breaks down to 1.32 percent of labor incomes going to legal Mexican immigrants and 0.58 percent to illegal Mexican immigrants. Making the standard assumption that capital comprises 30 percent of economic output, this means that Mexican-immigrant labor accounts for 1.34 percent of GDP, with 0.93 percent from legal Mexican immigrants and 0.41 percent from illegal Mexican immigrant labor. Thus Mexican immigrants have only a very small effect on the total U.S. economy. Although Mexican immigrants account for only a very small share of GDP, the effect on some sectors of the economy may be much larger. Table 6 shows the share of labor costs accounted for by Mexican immigrants. The table reads as follows: Of wages and benefits paid in the fishing, agricultural, and forestry sector, Mexican immigrants account for 14 percent.19 In contrast, in the financial services sector, they account for one-half of one percent. The table shows that in most sectors of the economy, Mexican immigrants account for a very small share of labor costs. Only in the agriculture sector do they account for more than 10 percent of labor costs. The other sectors where they have a larger impact are construction and the personal service sector (which includes maids, butlers, and hotel services), where they comprise about 5 percent of labor costs. The reason that they comprise such a small share of labor incomes is that relatively few immigrants work in managerial and supervisory positions (see Table 2, p. 20). Because they are so heavily concentrated in unskilled positions, their total impact on labor costs is modest for almost all sectors of the economy. It should also be remembered that Table 6 does not include non-labor costs to employers. As already discussed, if the costs of capital were included, the effect of Mexican immigrant labor would be smaller still. The analysis of wages and prices indicates that Mexican immigration in the 1990s has probably reduced wages for high school dropouts by between 3 and 8 percent. So far we have concentrated on the benefits to consumers of lower wages for unskilled workers. While economics can provide an understanding of the size of the wage and price effects of Mexican immigration, it cannot tell us whether this situation is desirable. In order to make a normative judgment, one needs to first examine the characteristics of those workers harmed by Mexican immigration. Although most natives are not in direct competition with Mexican immigrants, those who are include the poorest workers in the United States. Those adversely affected also comprise a large share of those lacking health insurance and of those on welfare. For example, one-fourth of adult native-born high school dropouts who work full-time live in poverty. Although they comprise only 8 percent of all adult natives who work full-time, high school dropouts account for 26.2 percent of full-time native-born workers living in poverty. Moreover, 31 percent (2.6 million) of the children of the native-born working poor are dependent on an adult who lacks a high school education.20 Natives who lack a high school education are also disproportionately those trying to move from welfare to work. More than one in four natives who worked in 1999, but who also used welfare during the year, had not completed high school.21 High school dropouts and their children are also often without health insurance. Of adult native dropouts who work full time, 30 percent are uninsured and 21.2 percent of their children do not have health insurance. Moreover, one-fifth of all natives and their children who are uninsured are either high school dropouts or a child dependent on a high school dropout for support. The impacts of Mexican immigration also fall disproportionately on the nation’s minority population. Of native-born whites who work full-time, 6.5 percent lack a high school education. In contrast, 11.5 percent of native-born African Americans and 19.8 percent of native-born Hispanics who work full-time do not have a high school diploma. Thus, the negative impact of Mexican immigration is likely to be felt more by native-born minorities than by whites. By reducing the wages and employment opportunities available for workers without a high school education, Mexican immigration can only make it more difficult for the unskilled to escape poverty, move off welfare, and afford health insurance. If policy makers wish to improve the situation for unskilled workers in the United States, then increasing Mexican immigration or leaving at its current high level would seem to be counter-productive, especially in light of the minimal effect on prices. Although many in the business community continue to want access to unskilled labor from Mexico, the available evidence indicates that high school dropouts are not in short supply. Between 1989 and 1999, the real wages (adjusted for inflation) of workers who lack a high school education and work full-time year-round declined by 7.2 percent.22 Basic economic theory predicts that if the economy were desperately short of this type of labor, then wages should have risen significantly, rather than fallen. The decline in wages for this group certainly calls into question the idea that not enough of these workers are available. It should also be pointed out that annual wages (adjusted for inflation) of full-time, year-round workers who have completed high school rose 9 percent during the same period. This rise in wages for more skilled workers indicates that the labor market for such workers was much tighter in the 1990s than for dropouts. It also means that the gap between the two groups has widened. The average, full-time, year-round high school dropout has gone from earning 61.7 percent of what more educated full-time workers make to earning only 52.6 percent of what the average worker with at least a high education makes. Thus, both in absolute terms and relative to other workers, the wages of dropouts have declined, not risen as should be the case if there were a shortage of unskilled labor. In fact, demand for unskilled labor is clearly declining. The number of jobs available for dropouts declined by 400,000 during the 1990s. This points to a fundamental incompatibility between the nation’s immigration policy, which admits 150,000 to 200,000 unskilled workers from Mexico each year, and economic developments which cause labor market opportunities for such workers to decline. While some employers may wish to have access to unskilled labor in order to keep labor costs down, there seems to be no shortage of high school dropouts in the United States. Looking at rates of poverty is very important because it provides a good deal of insight into Mexican immigration’s impact on the United States. Poverty rates have wide-ranging implications not only for the immigrants themselves but for society in general. If Mexican immigrants are finding it difficult to obtain a middle-class income, it implies that a significant proportion of immigrants are unable to succeed in the modern American economy, and it implies significant fiscal costs to the country as well. Persons who live in or near poverty are, by design, eligible for a wide range of means-tested programs. Moreover, because of the progressive nature of payroll and other taxes, those with low incomes pay relatively little in taxes. Finally, by consuming scarce public resources, an increase in the size of the low-income population as a result of immigration may hinder the ability of the nation to help those with low incomes already here. Poverty among immigrants in general and Mexican immigrants in particular is significantly higher than that of natives. In 1999, 11.2 percent of natives (compared to 16.8 percent of all immigrants) lived in poverty. The poverty rate for Mexican immigrants is dramatically higher than that of natives or immigrants in general. In 1999, 25.8 percent of Mexican-born immigrants lived in poverty — more than double the rate for natives. In other words, despite the current economic expansion, about one in four Mexican immigrants lives in poverty, compared to about one in ten natives. Because their poverty rates are so high, Mexican immigrants have substantially increased the overall size of the poor population in the United States. While Mexican immigrants and their U.S.-born children under age 18 account for 4.2 percent of the nation’s total population, they account for 3.3 million or 10.2 percent of the nation’s total poor population. In addition to examining poverty, it is also possible to examine persons who have an income that, while above the poverty threshold, still makes them quite poor by American standards. If "near" poverty is defined as an income of less than 200 percent of the poverty threshold, then 41.4 percent of immigrants and 28.8 percent of natives lived in or near poverty in 1999. Among Mexican immigrants, the rate of poverty/near poverty is 62.1 percent, more than double the rate for natives. Figure 7 shows the percentage of immigrants and their U.S.-born children living in or near poverty. In 1999, 27.9 percent of natives and their children lived in or near poverty, compared to 65.6 percent of Mexican immigrants and their children. Thus, almost two-thirds of Mexican immigrants and their children are poor or near poor — more than twice the rate for natives. The figure shows strong evidence that the income of Mexican immigrants increases significantly over time. Of Mexicans who have lived in the country 10 years or less and their U.S.-born children, 35.4 percent are in poverty and 71.7 percent live in or near poverty. For those who have lived in the country for 11 to 20 years, 28.9 percent are in poverty and 69.5 percent live in or near poverty. Poverty and near poverty drops still further for those who have lived in the United States between 21 and 30 years, with 20.1 percent living in poverty and 55.9 percent living in or near poverty. While Figure 8 indicates that Mexican immigrants clearly make progress over time, poverty remains a significant problem even after they have lived in the country for many years. Mexican immigrants who have been in the country for 21 to 30 years still have rates of poverty and near poverty that are significantly higher than those of natives, as do those who have lived in the country for more than 30 years. The high rates of poverty and near poverty for these long-time Mexican immigrants and their young children are striking because these immigrant families have had time to become familiar with life in their new country. Moreover, Mexican immigrants who arrived 21 to 30 years ago are 43 years old on average, 8 years older than the average native. Mexican immigrants who arrived more than 30 years ago are 58 years old on average— 23 years older than the average native. This is important because income generally rises with age and workforce experience. Because these immigrants are much older than natives, their rates of poverty and near poverty cannot be attributed to the youthfulness of this population. Overall, Figure 8 shows that while Mexican immigrants make significant progress over time, that progress still leaves them well behind natives. Using the method described previously to distinguish legal and illegal Mexican immigrants, Figure 9 reports poverty for legal and illegal Mexican immigrants and their U.S.-born children. Our estimates indicate that of the three million illegal aliens from Mexico, 972,000 (33 percent) live in poverty and 2.1 million (71.4 percent) live in or near poverty. This means that poverty for legal Mexican immigrants is 21.5 percent and the percentage in or near poverty is 56.5. Of course, a large share of the children living in Mexican immigrant families are American-born. This is true for both legal and illegal immigrants. As already discussed, it makes far more sense to include these children (under 18) with their immigrant parents even though they themselves are native-born. I estimate that in addition to the nearly three million illegal aliens from Mexico in the CPS, there are 1.2 million U.S.-born children of illegal aliens from Mexico living in the United States for a total of 4.2 million Mexican illegal immigrants and their U.S.-born children. Of these, 1.5 million (35.4 percent) are in poverty and 3.1 million (74.2 percent) live in or near poverty. The poverty rate for legal immigrants from Mexico and their American-born children is estimated at 24.8, percent and their poverty/near poverty rate is 60.7 percent. Two observations are clear from these estimates. First, illegal aliens from Mexico have significantly higher rates of poverty and near poverty than do legal Mexican immigrants. Second, poverty among legal Mexican immigrants is still dramatically higher than that of natives or other immigrants. In fact, the estimated rates of both poverty and near poverty for legal Mexican immigrants and their children is double that of natives. Thus, it is clear that legal status by itself does not explain the high rates of poverty and near poverty associated with Mexican immigrants. This means, for example, that if a large share of the Mexican population were legalized, as some have proposed, a huge gap still would remain with natives. Further support for this can be found by looking at the year of entry data in Figure 8, which shows that Mexican immigrants who have been in the country for between 21 and 30 years and their American-born children are still much more likely to be poor than natives. This, despite the fact that these immigrants are well established and virtually all of them are legal residents. Figure 10 shows average income from all sources for immigrants and natives in 2000. The average income for adult Mexican immigrants of $18,952 a year is less than half that of natives. Not surprisingly, the figure also shows that average income for Mexican immigrants rises significantly the longer they reside in the United States. Although there is significant progress, Figure 10 indicates that they never come close to matching the income level of natives. Even Mexican immigrants who have lived in the country for more than three decades still have an average income that is only 70 percent that of the average native. As is the case for poverty and near poverty, the much lower income of long-time Mexican immigrants is striking because these immigrants have had ample time to become familiar with life in their new home country and are much older than is the average native. Since income usually rises with workforce experience, these long-time residents should have higher incomes than natives, but in fact their incomes are much lower. Figure 11 reports average annual income for natives and Mexican immigrants by legal status. Like poverty, the situation for legal Mexicans is much better than for those in the country illegally. However, the average income of legal Mexican immigrants is still only 57 percent that of natives. As is the case with poverty, legal status alone clearly does not explain the much lower income of Mexican immigrants. It is worth noting that the above estimates for poverty and income by legal status are meant to provide insight into the economic and social standing of legal and illegal immigrants. They should not be seen as quantified absolute values. What these numbers do indicate is that Mexican immigrants lag far behind natives in income and poverty, and this difference is not only the result of illegal immigration. The heavy use of welfare by working Mexican immigrants suggests that a guestworker program may create significant fiscal costs. Because the modern American economy offers very limited opportunities for workers with little education, it may simply not be possible to allow large numbers of unskilled people into the country without increasing the number of people using the nation’s welfare system. Of course, the guestworker program envisioned by some of its advocates would likely place severe restrictions on use of means-tested programs by the guestworkers. However, as we will see in the next section, although illegal aliens also are barred from using welfare programs, illegal aliens often make use of such programs, mainly by receiving benefits on behalf of their native-born children. Using the same method to distinguish illegal aliens as before, Figure 16 reports estimated welfare use for households headed by legal and illegal Mexican immigrants. Not surprisingly, Figure 16 shows that almost without exception, use of means-tested programs is higher for households headed by legal Mexican immigrants than for those headed by illegal Mexican immigrants. For many programs, in fact, use rates for legal Mexican immigrants are more than twice that of native-headed households. However, the results also indicate that illegal immigration imposes significant costs on public coffers. Whereas 14.8 percent of native households use at least one of the five major welfare programs, among households headed by an illegal alien from Mexico the figure is 24.9 percent. Illegal immigrants from Mexico primarily receive welfare benefits on behalf of their American-born children. Overall, the results in Figure 16 indicate that whether legal or illegal, immigrants from Mexico make heavy use of means-tested programs. The findings in Figure 16 also suggest that one possible unintended consequence of legalizing Mexican illegals already in the country would be to substantially increase their use of means-tested programs. Use of means-tested programs by illegal immigrants from Mexico points to a fundamental problem that would almost certainly exist with any guestworker program. Even if guestworkers are made technically ineligible for means-tested programs, it seems almost certain that they would make use of them anyway by receiving benefits on behalf of their native-born children. After all, the findings in Figure 16 indicate that despite an outright ban on their use, illegals from Mexico actually use such programs at higher rates than natives in many cases. Any guestworker program would bring in large numbers of immigrants from Mexico with very low skill levels and resulting low incomes. Their low incomes coupled with their children’s eligibility would mean very significant costs to taxpayers even if the guestworkers themselves are successfully barred from using such programs. One of the most troubling social trends in recent years has been the rapid increase in the number of people without health care insurance. Although there was a decline in the number of uninsured between 1998 and 1999, 42.6 million U.S.-residents are without health insurance coverage — almost 11.5 million more than in 1987. A larger uninsured population has broad-ranging effects on the nation’s entire health care system. Increases in the size of the uninsured population strain the resources of health care providers who struggle to provide services to the uninsured. Moreover, Americans with insurance have to pay higher premiums as health care providers pass along some of the costs of treating the uninsured to paying costumers. Taxpayers, too, are affected as federal, state, and local governments struggle to provide care to the growing ranks of the uninsured. While no definitive estimate exists, it is likely that between $15 and $30 billion a year, not including the cost for Medicaid, is spent providing services to the uninsured by governments at all levels. Although there is no single government program involved, providing care to the uninsured is a significant expense for society, with much of the cost borne by taxpayers and those who do have health insurance. More than half (52.6 percent) of Mexican-born persons living in the United States have no health insurance. For natives the corresponding figure is 13.5 percent.25 While not as prevalent as among Mexicans, lack of insurance is also common among immigrants in general. In 1999, 33.4 percent of the foreign-born were uninsured. Not surprisingly, lack of insurance is also a severe problem among the U.S.-born children (under age 18) of Mexican immigrants, with almost one-third lacking coverage.26 The children of Mexican immigrants are more likely to have insurance than their parents because a large percentage of those born in the United States are covered by Medicaid. 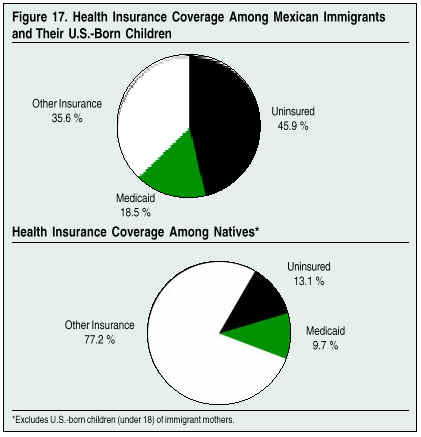 Figure 17 shows the percentage of Mexican immigrants and their American-born children without health insurance. The figure shows that 45.9 percent of Mexican immigrants and their U.S.-born children do not have health insurance, compared to 13.1 percent of natives and their children. The figure also shows that 18.5 percent of Mexicans and their children are covered by Medicaid compared to 9.7 percent of natives. The fact that Mexican immigrants and their children are more likely than natives to use Medicaid means that by itself, lack of Medicaid use does not explain why so many Mexican immigrants and their children do not have health insurance. The results in Figure 17 show that 64.4 percent of Mexican immigrants and their children either have no health coverage or have it provided to them at government expense. Overall, Mexican immigration has contributed significantly to the size of the nation’s uninsured population. Although they comprise 4.2 percent of the nation’s entire population, the 5.3 million Mexican immigrants without health coverage and their U.S.-born children under age 18 account for 12.5 percent of the uninsured. Moreover, immigration from Mexico accounts for a significant share of the increase in the nation’s uninsured population over the last decade. Mexican immigrants who arrived between 1988 and 1999 and the children born to these immigrants after they settled in the United States accounted for 28.7 percent or 3.3 million of the total growth in the size of the uninsured population after 1987. Thus Mexican immigration has played a significant role in exacerbating the nation’s health insurance coverage crisis. Even after they have lived in the country for many years, lack of health insurance remains a severe problem among Mexican immigrants. Figure 18 shows health insurance coverage among Mexicans based on years of residence in the United States. The figure shows that 62.9 percent of immigrants from Mexico who have lived in the United States for 10 years or less are uninsured. For those who have lived in the United States between 11 and 20 years, 47.5 percent are uninsured; among those who came to the country 21 to 30 years ago, 38.8 percent were without health insurance; and for those who arrived more than 30 years ago, 28 percent were still uninsured in 2000. Thus, while Mexican immigrants clearly make progress the longer they live in the United States, those who have lived in the country for many years are still more than twice as likely as natives to be without health insurance. Among the nearly three million illegal aliens from Mexico in the CPS, we estimated that more than two-thirds, 68.4 percent, do not have health insurance coverage. However, lack of insurance is common even among the estimated 4.9 million legal Mexican immigrants living in the United States. We estimated that 41.4 percent of legal Mexican immigrants do not have insurance, making them more than three times as likely as natives to be uninsured. Clearly, lack of health insurance coverage among the Mexican-born population is not simply a matter of legal status. As is the case with poverty, income, and welfare, the low skill level of Mexican immigrants has a direct bearing on why so many lack insurance. Because of the limited value of their labor in an economy that increasingly demands educated workers, many immigrants hold jobs that do not offer health insurance, and their low incomes make it very difficult for them to purchase insurance on their own. As we have seen, the social and economic status of Mexican immigrants lags far behind that of natives and other immigrants. The primary reason for this is that a very large share of Mexican immigrants lack a formal education. Figure 19 reports poverty, poverty/near poverty, lack of health insurance, and welfare use for Mexican immigrants who have not graduated from high school and for those who have at least a four-year college education. In comparison to natives, Figure 19 shows that poverty, lack of health insurance, and welfare use are all dramatically higher for dropouts than for Mexican immigrants with a college education. For example, Mexican immigrants who have not graduated from high school are almost three times as likely as natives to live in poverty. In contrast, only 2.8 percentage points separate the poverty rate of natives and college-educated Mexican immigrants. In terms of welfare use, households headed by Mexican immigrants who are dropouts are more than twice as likely as natives to use at least one major welfare program. While households headed by a college-graduate Mexican immigrant are still somewhat more likely than native households to use welfare, the difference is nowhere near as large as it is between natives and dropout Mexican immigrants. The one area where education seems to have less of an impact is on health insurance coverage. Lack of health insurance coverage among college-educated Mexican immigrants is common, with 36.8 percent of college-graduate Mexicans uninsured. Of course, more-educated Mexican immigrants are still more likely than those with little education to have insurance. But it appears that a large share of the difference remains even after controlling for education levels. Other factors such as cultural attitudes toward insurance likely explain why such a large percentage of Mexican immigrants do not have health insurance. The findings in Figure 19 are certainly to be expected. Education levels have become a key determinant of economic and social success in United States. Thus, more-educated Mexican immigrants tend to have a socio-economic standing that more closely resembles that of natives than do less-educated Mexicans. Because such a large share of Mexican immigrants lack a high school education and few are college graduates, the overall position of Mexicans is dramatically lower than natives. In addition, this large gap in education levels explains to a large extent why Mexican immigrants are unable to close the gap with natives even after they have lived in the United States for many years. In the last few years, a good deal of attention has been focused on the dramatic increases in enrollment experienced by many school districts across the country. The U.S. Department of Education recently reported that the number of children in public schools has grown by nearly 8 million in the last two decades. All observers agree that this growth has strained the resources of many schools districts. While it is sometimes suggested that most of the increase is the result of the children of baby boomers reaching school age, data from the CPS indicate that "the baby boom echo," as it has sometimes been called, does not explain the growth in the number of children in public schools. Table 7 shows that there are 8.6 million school-age children (ages 5 to 17) of immigrants in the United States. The children of Mexican immigrants account for 3.2 million, or more than one-third. The children of immigrants account for such a large percentage of the school-age population because a higher proportion of immigrant women are in their childbearing years and immigrants tend to have more children than natives. This is especially true for Mexican immigrants. Of the 3.2 million school-age children of Mexican immigrants, 2.9 million are immigrants who arrived after 1982 or the U.S.-born children of Mexican immigrants who arrived after 1982. Thus, by itself Mexican immigration accounted for more than a third of the national increase in the size of the school-age population since the early 1980s. In some states the impact of Mexican immigration is even larger. Table 7 shows that Mexican immigration has had a very substantial impact on the size of the school-age population in states such as California, Texas, Arizona, and Nevada. Of course, a dramatic increase in enrollment may not create a problem for public education if tax revenue increases proportionately. But the average annual income of Mexican-headed households is $35,024, or only 64.7 percent of the $54,110 for native households. Since tax payments generally reflect income levels, the tax contributions made by immigrant families are almost certainly not enough to entirely offset the costs they impose on public schools. This is especially likely to be the case because Mexican households have twice as many school-age children on average as do native households.27 The added cost of providing services to students with limited English language skills is also likely to strain the resources of many school systems. The absorption capacity of American public education is clearly an important issue that needs to be taken into account when formulating a sensible immigration policy. Failure to consider this question may have significant consequences for schools in a number of states. This report has focused on the characteristics of Mexican immigrants at the national level. While legal immigration policy and the level of resources devoted to controlling illegal immigration are determined at the national level, the impact of immigration is felt at the local level. Table 8 reports selected characteristics for Mexican immigrants in the states with the largest Mexican-born populations. Turning first to citizenship rates, Table 8 shows that in every state with a large Mexican population, citizenship rates among Mexican immigrants are very low. The highest percentage is found in Texas, where 25 percent of Mexican immigrants are naturalized citizens. It should be noted that, as already discussed, nearly 40 percent of the Mexican-born population in the CPS are illegal aliens. This significantly reduces overall citizenship rates among Mexican immigrants. However, even if one removes illegals, it would still mean that fewer than one-half of legal Mexican immigrants have become citizens. The rates of poverty/near poverty among Mexican immigrants and their U.S.-born children (under age 18) indicate that, in every state, Mexican immigrants have extremely high rates of poverty and near poverty. In every state but Illinois, the rate of poverty/near poverty associated with Mexicans is at least double the rate for natives. In a number of states, Mexican immigrants and their children by themselves make up a large share of the poor/near poor population. In Arizona, they comprise 25 percent of all those in or near poverty. In Texas, it is 19 percent and in California, Mexican immigrants and their young children account for 34 percent of all persons in or near poverty. The figures for California are striking because Mexican immigrants and their children account for 17 percent of the state’s total population. Like those for poverty, the figures for welfare use are much higher among Mexican than native households in every state with the exception of Illinois. As a result of their high use rates, Mexican immigrant households account for a significant share of the welfare case load in a number of states. In California, almost one-fourth of all households in the state receiving welfare are headed by a Mexican immigrant. In Arizona, Mexican households account for 22 percent of all households using welfare and in Texas, 14 percent of households receiving welfare are headed by a Mexican immigrant. Turning to health insurance coverage, Table 8 indicates that, in every state, Mexican immigrants and their children are more than twice as likely as natives to be without health insurance. In some states, lack of health insurance among Mexican immigrants is more than triple that of natives. Not surprisingly, Mexican immigrants and their minor children make up a large percentage of the entire uninsured population in a number of states. In California, Mexican immigrants and their children comprise more than one-third of the uninsured. To a very significant degree, the health insurance crisis in California is being driven by immigration from Mexico. The same is true in Arizona, where 31 percent of the uninsured are either Mexican immigrants or the U.S.-born children of Mexican immigrants. Even in Colorado, where Mexican immigrants and their children account for less than 6 percent of the state’s entire population, they comprise more than one-fifth of the uninsured. The findings in Table 8 indicate that Mexican immigration has dramatically increased the size of the low-income and uninsured populations as well as increased the overall welfare case load in several states. Clearly, the impact of Mexican immigration on the states is something that policy makers need to consider carefully. Table 8 indicates that failure to consider these effects has significant consequences for a number of states. The primary focus of this report has been the impact of Mexican immigrants on the United States. The analysis indicates that the welfare use, income, educational attainment, health insurance coverage, and other measures of socio-economic status for Mexican immigrants lag far behind natives and other immigrant groups. This is true even for those Mexicans who have lived in the country for many years. So far in this report we have not examined persons of Mexican ancestry who themselves were born in the United States. Since the Current Population Survey asks respondents where their parents were born as well as ancestry for persons who are Hispanic, it is possible to examine by generation what is often referred to as the Mexican-origin population. Examining progress over generations is important because it may provide some insight into how the children of today’s Mexican immigrants will do when they reach adulthood. Native-Born Mexican-Americans Lag Far Behind Other Natives. Figure 20 reports educational attainment, welfare use, and rates of poverty/near poverty for Mexican immigrants and second- and third-generation Mexican-Americans. Turning to educational attainment first, the figure shows significant progress between the first generation and second generation. Second-generation Mexican-Americans are much more likely to have completed high school than Mexican immigrants. This is also true for the third generation. However, relative to other natives, second- and third-generation Mexican-Americans have much higher dropout rates. They also have much lower rates of college graduation than other natives. Perhaps even more troubling is that there is no evidence of progress between the second and third generation. About one-fourth of second- and third-generation Mexican-Americans have not completed high school. At the high end of the education distribution, there is some evidence of progress between the first, second, and third generations. But despite progress, even third-generation Mexican-Americans are much less likely than other natives to have completed a four-year college degree. Turning to welfare use, the figure indicates that second-generation Mexican-Americans are somewhat less likely to use welfare than Mexican immigrants. However, there seems to be no progress in lowering their use of welfare between the second and third generation. In fact, welfare use rises in the third generation, making them as likely to use welfare as Mexican immigrants. Moreover, even the second generation is still much more likely to be on welfare than are natives in general. The rate of poverty/near poverty follows a very similar pattern. There is significant progress from the first to the second generation and then a deterioration among third-generation Mexican-Americans. As with welfare use, poverty seems to increase slightly between the second and third generations. And of course, in comparison to other natives, native-born Mexican-Americans, both second and third generation, lag far beyond. While it is beyond the scope of this study, it is likely that several factors — including discrimination and culture — explain why persons of Mexican ancestry remain well behind other natives. One factor that is likely to have contributed to the pattern in Figure 20 is the low skill level of Mexican immigrants who entered the country in decades past and whose children are represented by the second and third generations. Figure 20 indicates that many of their children have found it very difficult to close the gap with other natives. Research by George Borjas indicates that those immigrant groups that arrive with fewer skills tend to remain poorer than those groups who arrive better educated. He concludes that, "differences in skills and labor market outcomes may persist across generations and need never converge. "30 Whatever the reasons for the results in Figure 20, it is clear that Mexican-Americans have not been able to reach the same socio-economic status as other natives. If this trend continues, many of the children of current and even future Mexican immigrants may also find it difficult to reach parity with other Americans. Thus the low skill level of Mexican immigrants now entering the country may have significant long-term consequences for Mexican-Americans over much of this century. This report has found that Mexican immigration creates significant challenges for the United States. It has added significantly to the size of the poor and uninsured U.S. populations, as well as substantially added to the welfare caseload in the United States. For example, while Mexican immigrants and their young children comprise 4.2 percent of the nation’s total population, they comprise 10.2 percent of all persons in poverty. They also comprise 12.5 percent of those without health insurance. Perhaps most troubling, the findings show that the welfare use, income, and other measures of socio-economic status of legal Mexican immigrants do not converge with natives over time. Legal Mexican immigrants who have lived in the United States for many years do not enjoy a standard of living similar to that of natives. Their low incomes coupled with high use of means-tested programs create very significant fiscal costs for the country as well. Based on research by the National Academy of Sciences, the lifetime net fiscal drain (taxes paid minus services used) on public coffers created by the average adult Mexican immigrant is estimated to be more than $55,000. While employers may want increased access to unskilled Mexican labor, this cheap labor comes with a very high cost. The primary reason why Mexican immigrants have not faired well is that a very large share have little formal education at time when the U.S. labor market increasingly rewards skilled workers, while offering very limited opportunities to the unskilled. The heavy concentration of Mexican immigrants at the bottom of the labor market also is likely to have a significant negative effect on wages for unskilled natives who are in direct competition with them. Mexican immigrants now comprise 22 percent of all the high school dropouts in the work force, while they comprise 1.5 percent of all workers with more than a high school education. Therefore, it is only the lowest-skilled workers who are adversely affected by Mexican immigration. Because the vast majority of natives have completed high school and are employed in higher-skilled occupations, most natives do not face significant job competition from Mexican immigrants. However, there are more than 10 million adult native-born workers who lack a high school education in the U.S. workforce. Consistent with previous research, the results in this study indicate that these less-educated natives face significant job competition from Mexican immigrants. And those native-born workers adversely affected by Mexican immigration are among the poorest in the United States and are also disproportionately native-born minorities. Moreover, it is difficult to justify reducing the wages of unskilled workers since their wages, unlike those for other workers, actually declined in the 1990s, indicating that there is no shortage of high school dropouts in the United States. Although reducing the wages for unskilled workers creates benefits for consumers, the benefits are estimated to be extremely small because wages paid to high school dropouts account for only a tiny fraction of the expenses incurred by employers. For example, high school dropouts are estimated to account for less than 3.72 percent of total cost to employers. Thus even if Mexican immigration reduced their wages by 10 percent, this would reduce consumers prices by less than four-tenths of one percent. And this is true only if employers pass on all of the saving to their customers. It is simply not possible for a technology-based economy such as the United States, in which skilled labor and capital comprise the overwhelming share of the economic output, to derive large benefits from unskilled immigration. Moreover, because it harms the poor and creates significant fiscal costs for taxpayers, it would seem to make far more sense to reduce Mexican immigration (legal and illegal) in the future and at the same time work to improve the skills of legal Mexican immigrants already here so as to facilitate their integration into American society. The findings in this report indicate that the primary reason for the higher rates of poverty, welfare use, lack of health insurance coverage, and the large fiscal costs Mexican immigrants impose on taxpayers stem largely from the fact that most have little formal education. Since the long-term trend of increasing wages for skilled workers while declining or stagnant wages for the unskilled is likely to continue, the most obvious means to improve the situation for Mexican immigrants already here would be to increase their skills. Our efforts to integrate Mexican immigrants into the economic mainstream should therefore focus on job retraining and other efforts designed to improve their ability to compete in the modern American economy. Increasing their ability to compete in the labor market by improving their job skills would not only improve their economic situation, it would reduce the fiscal costs they impose on taxpayers. Related to these efforts, more resources should also be devoted to increasing Mexican immigrants’ familiarity with their new country. This may include public/private partnerships for adult education programs designed to increase knowledge of English and the U.S. job market. Perhaps most important, a greater effort must be made to improve public education in areas of heavy immigrant settlement to ensure that the lower education level of Mexican immigrants does not persist through the generations. Clearly, the success of the millions of Mexican immigrants and their children who now live in the United States is important not only to their future but also important to the future of the country as a whole. In most years, more than 90 percent of visas allotted to Mexican immigrants go to the family members of U.S. citizens and non-citizen lawful permanent residents (LPRs). Of course, immigration policy should not be changed in order to reduce Mexican immigration specifically; rather it should be changed to reduce unskilled immigration in general. Any change would have to apply to all countries — not just Mexico. By limiting which relatives are eligible for admission, we could reduce the number of immigrants who are admitted without regard to their skills. The Commission on Immigration Reform chaired by the late Barbra Jordan suggested limiting family immigration to the spouses, minor children, and parents of citizens and the spouses and minor children of LPRs, eliminating the preferences for adult children and siblings. The preference for the spouses and children of non-citizens should also probably be eliminated, since these provisions apply to family members acquired after the alien has received a green card, but before he or she has become a citizen.33 If the parents of citizens were also eliminated as a category, family immigration from Mexico would be reduced by more than half to roughly 50,000 or 60,000 a year. Changing legal immigration in this way would significantly reduce the number of legal immigrants from both Mexico and other countries admitted in the future without regard to their ability to compete in the modern U.S. economy. Reducing illegal immigration should also be made a much higher national priority. The analysis done here indicates that there are at least 3 million and perhaps closer to 4 million illegal aliens from Mexico living in the United States. Illegal immigration from Mexico has added significantly to the size of the poor and uninsured populations in the United States. Because they receive benefits on behalf of their native-born children, illegal immigrants have also added to the welfare caseload. But perhaps most important, in a nation based on the rule of law, it should not be acceptable to have millions of people living in the country without permission. Among those who study the issue, there is broad agreement that cutting illegal immigrants off from jobs offers the best hope of reducing illegal immigration. Since 1986, it has been unlawful to employ illegal aliens. To date, however, worksite enforcement efforts have been ineffective. Three steps are needed to make worksite enforcement more effective: First, a national computerized system that allows employers to verify that persons are legally entitled to work in the United States needs to be implemented. Tests of such systems have generally been well received by employers. Second, the Immigration and Nationalization Service (INS) must significantly increase worksite enforcement efforts. Congress has repeatedly failed to increase funding for worksite enforcement, even though the INS continues to ask for more agents. Third, more needs to be done at the border. Despite increases in funding over the last few years, efforts along the southern border remain grossly inadequate. A real effort to control the border with Mexico would require perhaps 20,000 agents and the development of a system of formidable fences and other barriers along those parts of the border used for illegal crossings. The cuts in legal immigration proposed earlier would also go a long way toward reducing illegal immigration in the long run because the current system of legal immigration creates a strong incentive to come illegally. There are approximately four million people qualified for immigration to the United States but who are waiting their turn to receive the limited number of visas available each year in the various family categories. Such a system encourages those who have been selected, but have to wait, to simply come to the United States and settle illegally in anticipation of the day they are granted visas. Eliminating the sibling and adult children categories would alleviate this situation by doing away with the huge waiting lists. In addition to reducing the incentive to come before a green card is issued, cuts in legal immigration would also be very helpful in controlling illegal immigration because communities of recent immigrants serve as magnets for illegal immigration, providing housing, jobs, and entree to America for illegals from the same country. It is no coincidence that the top immigrant-sending countries are also the top countries in sending illegal immigrants to the United States. Sociological research shows that one of the primary factors influencing a person’s decision to emigrate is whether a family member or member of their community has already come to United States.32 Thus, allowing in large numbers of legal immigrants is one of the leading causes of large-scale illegal immigration. While some may favor guestworker programs in an effort to have access to immigrant labor without the fiscal costs, the heavy use of means-tested programs by the families of illegal aliens shows that this is unlikely to work. While illegals are generally barred from using means-tested programs, this has not prevented them from making use of such programs because they typically receive welfare on behalf of their the U.S.-born children, who have eligibility like any other native. Moreover, the negative fiscal effect of Mexican immigration is not simply a result of the immigrants’ heavy use of means-tested programs; it is also caused by their much lower incomes and resulting lower tax payments. Because the primary reason for their low incomes is that so many are unskilled and this fact would not be changed by making them guestworkers, a new guestworker program is likely to impose significant costs on American taxpayers. It is simply not possible to bring in large numbers of unskilled workers — whether they come illegally, as legal immigrants, or as guestworkers — without creating significant fiscal costs. In addition, by increasing the supply of unskilled workers, guestworkers would still adversely affect the wages of natives and immigrants already here working in low-wage, unskilled jobs. And these workers already have the lowest incomes and highest unemployment rates. Finally, it is worth considering that in every country that has attempted to have a guestworker program, it has always resulted in permanent immigration. As one commentator has observed, "there is nothing more permanent than a temporary worker." The findings in this report indicate that if the United States wishes to pursue its national interests, then reducing immigration from Mexico would make a great deal of sense. However, there are other arguments that could be marshaled in support of continued high levels of immigration from Mexico. First, there is simple altruism. If this is to be the argument for Mexican immigration, then policy makers and others need to make it clear to the American public that although Mexican immigration imposes very real costs on taxpayers and especially on the working poor, the costs incurred are necessary in order to give some fraction of the Mexican population a chance at a better life. Failure to acknowledge the costs is likely to invoke a very negative reaction from the public as they become aware of the problems created by Mexican immigration. Additionally, once we make the benefits for foreign citizens the justification, immigration in effect becomes a foreign aid program. As such, the costs of Mexican immigration to taxpayers need to be evaluated like any other foreign aid program. It seems very likely that such an evaluation would find that allowing a small share of Mexico’s population into the United States each year is not the most cost-effective way of helping people in Mexico. It would probably make more sense to provide various forms of development assistance to that country, thereby reaching a much larger share of its population. A second argument for Mexican immigration combines altruism with practical considerations about the need for the United States to act as an "escape valve" for Mexico. It is often suggested that because Mexico finds it difficult to meet the employment and other needs of its own people, the United States should allow in immigrants to prevent social discontent from possibly destabilizing Mexico. Of course, there is a very strong counter position which points out that by providing an escape valve, the United States may in fact reduce pressures for change in Mexico, thereby hindering its development. But again, if the escape valve argument is to be the primary justification for Mexican immigration, policy makers in the United States need to honestly acknowledge the costs to the American people. Another argument is that United States simply cannot control illegal immigration at a reasonable cost. This argument is partly the reason why many in Congress wish to legalize illegal aliens already here and/or create a new guestworker program. Of course, the primary problem with this argument is that, at present, it is entirely undemonstrated. Partly at the behest of the business community, Congress has chosen not to take even the most elementary steps necessary to reduce illegal immigration, such as creating a computerized system to allow employers to verify the legal status of all new hires or allocating the necessary funds so that the INS can hire the worksite inspectors it needs. Even when the INS has tried to stop the employment of illegals, Congress has intervened to prevent it from enforcing the law.33 Based on the available evidence, it is simply not possible to argue that illegal immigration from Mexico cannot be reduced. If policy makers decide that the costs are indeed too high, such a determination must also be accompanied by an honest public discussion about the enormous costs of unskilled immigration. Because the two countries share a 2000-mile border, there can be no doubt that the futures of Mexico and the United States are intimately bound together for all time. While migration is only one of the many issues affecting the two countries, it is perhaps the most intractable because the interests of the two countries do not coincide. Whereas the Mexican government has made clear its desire that more immigrants be allowed to come north, the available data suggest that the costs to the United States clearly outweigh the benefits. Therefore, finding common ground on the issue will be extremely difficult. While no one debates the right of the United States to decide who may immigrate, pursuing its national interests by reducing unskilled immigration from Mexico may adversely affect relations with Mexico. However, there are many other important issues such as trade, investment, the environment, and drug interdiction on which the interests of the two countries do coincide and therefore a strong working relationship is likely to continue. Putting aside the effect on U.S.-Mexico relations, the political situation within the United States also makes it difficult for the country to pursue its national interests. Even though economic analysis indicates that it is simply not possible for unskilled immigration from Mexico to create significant benefits for United States, those businesses that rely on unskilled labor will likely fight very hard to make sure that there is an abundant supply of such labor in order to keep down their labor costs. Mexican immigration, in effect, acts as a subsidy for employers who use unskilled, low-wage labor. The fact that many Mexican families are dependent on taxpayers to provide means-tested programs, and that Mexican immigration contributes to school overcrowding and drives down wages for the working poor, is not something employers take into account. The costs are diffuse, borne by all taxpayers, while employers have a very strong incentive to minimize their labor costs. By providing food stamps, free school lunches, Medicaid, the EITC, and other programs, taxpayers are in effect paying part of the salary for these workers. This is an extremely desirable situation for employers, and like any business receiving a subsidy, those who use unskilled labor will try very hard to retain the subsidy. The fact that some businesses wish to retain this subsidy cannot, however, justify the costs to taxpayers, the dramatic increase in poverty it creates, or the reduction in wages for the poorest American workers. Therefore, political leadership needs to acknowledge these problems and work to lower the level of unskilled immigration from Mexico. Equally important, policy makers should also devote considerable attention to the plight of legal Mexican immigrants and their young children already here. 1 The Current Population Survey is conducted each month and includes over 130,000 individuals. While its primary purpose is to collect information on employment, the survey contains detailed questions on income, welfare use, health insurance coverage, and many other topics. 2 The high-level binational panel consists of Secretary of State Colin Powell, Attorney General John Ashcroft, Mexican Interior Secretary Santiago Creel, and Mexican Foreign Secretary Jorge Castaneda. There are a number of competing proposals being discussed by Congress. The various guestworker programs differ mainly over the question of legal permanent residency. Senator Phil Gramm’s (R-Texas) proposal would allow Mexican illegal aliens already residing within the United States to apply for a temporary visa, which would permit them to work for one year in the United States. After that, the workers would be required to return to Mexico and apply for re-entry. Following three successive years, the workers would return to Mexico, fulfill a one-year waiting period, and could then reapply for the program. The plan includes hour and wage protection for the workers, but it does not include the prospect of permanent residence. In contrast, Senator Gordon H. Smith (R-Ore.) and Representative Howard L. Bermann (D-Calif.) have proposed eliminating the burden on the agricultural industry to show a need for additional laborers. Under their plan, illegal aliens who have worked in agriculture for six years would be eligible for permanent residency. Other members of Congress have proposed granting an amnesty to some or all of the illegal immigrants living in the United States. Senator Henry Reid (D-Nev.) has suggested allowing Mexican illegal aliens who have worked in the United States since 1981 to be eligible for green cards. Representative Luis Gutierrez (D-Ill.) has proposed granting legal status to any illegal alien who has worked in the United States for the past five years. Think tanks and academics have also contributed to the discussion. The Carnegie Endowment for International Peace held a binational panel on U.S.-Mexican migration policy in February of 2001. Among the panel’s recommendations were the legalization of illegal-alien Mexicans who are "established and working" and increasing the size of work visa programs. With regard to the criteria of the programs, the panel listed equitable labor rights, social and health protections, and permanent residence eligibility for qualified workers. The Mexican government has remained cautiously ambiguous when commenting about immigration. Central to their concerns are the "regularization" of Mexican illegal aliens. While this includes permanent visas, employment protections, and Social Security benefits, they have not voiced support for any specific legislative proposal. 3 The Current Population Survey is conducted each month and includes more than 130,000 individuals. While its primary purpose is to collect information on employment, the Survey contains detailed questions on income, welfare use, health insurance coverage, and many other topics. 4 All persons not born in the United States, one of its outlying territories, or of U.S. parents living abroad are considered immigrants. All persons born in the United States, including the children of illegal aliens, are considered natives. The foreign-born population in the CPS includes perhaps five million illegal aliens (an estimated three million from Mexico) and also persons on long-term temporary visas, such as students and temporary workers. The survey is considered such an accurate source of information on the characteristics of the foreign-born because unlike the decennial census, households in the CPS receives an in-person visit from a Census Bureau-trained interviewer. 5 The occupations in which Mexican immigrants are most concentrated in Table 2 are: service occupations (not private household), which includes such jobs as security guard, cooks, waiters, and child care workers; farming (except managerial), primary agricultural and horticultural laborers; precision, production craft and repair, which includes mechanics, repairmen, metal workers, meat processing, and construction trades (e.g. masons); and operators, fabricators, and laborers, comprised mostly of factory workers, warehouse workers, and drivers. 6 I assume that the Mexican illegal population is composed of Mexican-born persons who arrived between 1980 and 2000, do not have citizenship, and do not themselves receive cash assistance means-tested programs, food stamps or Medicaid. For Mexican illegals 18 years of age and older, I further assume that they do not have a high school degree, are less than 60 years of age, and are not married to a U.S. citizen. For persons under age 18, I assume that their parents met the above criteria and that they, too, do not use cash assistance and are themselves non-citizens. One disadvantage of this approach is that it does not include Mexicans who are in the country illegally but arrived prior to 1980. However, past research indicates that this number is likely to be very small and does not have a significant effect on the data. It should also be noted that because education is one of the factors used to determine legal status, it is not possible to estimate the educational attainment of illegal Mexican immigrants. 7 Robert Warren. Annual Estimates of the Unauthorized Immigrant Population Residing in the United States and Components of Change: 1987 to 1997, Draft: 8/21/00. Office of Policy and Planning U.S. Immigration and Naturalization Service. 8 Jaeger, David A. 1996. "Skill Differences and the Effect of Immigration on the Wages of Natives." Bureau of Labor Statistics Working Paper #274. 9 Borjas, George, Richard B. Freeman, and Lawrence F. Katz. 1997. "How Much Do Immigration and Trade Affect Labor Market Outcome?" Brookings Papers on Economic Activity. Washington D.C.: Brookings Institution Press. Vol 1. 10 Edmonston, Barry, and James Smith, eds. 1997. The New Americans: Economic, Demographic, and Fiscal Effects of Immigration. Washington D.C.: National Academy Press. 11 McCarthy, Kevin F., and Georges Vernez. 1997. Immigration in a Changing Economy: California’s Experience Santa Monica, Calif.: Rand. 12 Reimers, Cordelia W. 1998. "Unskilled Immigration and Changes in the Wage Distributions of Black, Mexican-American, and Non-Hispanic White Male Dropouts." In Help or Hindrance? The Economic Implications of Immigration for African-Americans. Daniel S. Hamermesh and Frank D. Bean, eds. New York: Russell Sage Foundation. 13 Kposowa, Augustine J. 1995. "The Impact of Immigration on Unemployment and Earnings Among Racial Minorities in the United States." Racial and Ethnic Studies Vol. 18. pp. 605-628. Partridge, Mark D., Dan S. Rickman, and William Levernier. 1996. "Trends in U.S. Income Inequality: Evidence from a Panel of States." The Quarterly Review of Economics and Finance. Vol. 36. 14 The CPS not only asks individuals where they were born, it also asks what year they came to live in the U.S.
15 Earnings and non-wage benefits data in the March CPS aggregated by educational attainment indicate that full-time dropouts (both full and part year) account for 5.3 percent of labor incomes. 16 Autor, David, Lawrence F. Katz and Alan Krueger. 1997. March. "Computing Inequality: Have Computers Changed the Labor Market?" Working Paper 5956. Cambridge, Mass. : National Bureau of Economic Research. 17 Like trade, immigration should also generate benefits to the U.S. economy by bringing in workers who would not otherwise be available. This allows natives to specialize in those things they do well, leaving those things they do less well to immigrants — the concept of comparative advantage. Since workers are doing what they do best, there should be some increase in the overall level of wealth in the United States from immigration. However, since Mexican immigration is providing the United States primarily with increased access to unskilled labor, which the labor market puts a very low value on, the overall benefit from Mexican immigration must be very small. This is especially true because imports and labor-saving devices in many cases could be substituted for Mexican immigrant labor. 18 One of the limitations of this analysis is that the estimated impact of Mexican immigration on the price of goods and services produced in the United States is for all goods and services. It does not tell us the fraction of goods and services consumed by typical consumers that are provided by high school dropouts. For example, more affluent Americans who employ domestic servants are probably in a better position to benefit from reductions in wages for unskilled workers than is the average American. This means the impact of Mexican immigration on prices will not be felt uniformly by all households in the United States. 19 Because forestry and fishing are very small sectors, examining them separately has almost no effect on the results in Table 5. In 1999, Mexican immigrants account for 15 percent of labor costs for employers in just the agriculture sector rather than the 14 percent reported in Table 5. 20 Figures are for only the children of natives. 21 Figures are for persons who worked full- or part-time during the year. Major welfare programs included: Temporary Assistance to Needy Families, general assistance, food stamps, public housing, Medicaid, and SSI. 22 Figures are based on author’s comparison of average annual wages and salary for full-time, year-round workers using the March 1990 and March 2000 CPS. statistics, and they are not included in this study. The March CPS asks families about their annual income in the year prior to the survey. The poverty threshold for the typical family of four in 1999 was $17,029. 24 As already discussed, the CPS asks individuals what year they came to live in the United States. The native-born children of immigrants are linked with their parents. 25 This 13.5 percent figure includes the American-born children (under18) of immigrants. The numbers in Figure 17 do not include these children. 26 These figures include the American-born children of Mexican immigrants. 27 The March 2000 CPS indicates that the average household headed by a Mexican immigrant has 1.13 school-age children compared to 0.48 for the average native-headed household. While these numbers may seem low, it should be remembered that these figures include households headed by the elderly and young single people, who generally have no children living with them. 30 George J. Borjas. February 1992. "Ethnic Capital and Intergenerational Mobility," The Quarterly Journal of Economics. p. 148. 31 There is currently a large backlog of persons waiting to enter in the spouses and minor children of Lawful Permanent Residents category. A significant portion of these individuals are the family members of IRCA amnesty beneficiaries. It seems unwise to continue to separate these families. Therefore, it would make sense to grandfather in those already on the waiting list. However, no future applications would be taken for the spouses and minor children of LPRs. 32 Massey, Douglas S.; Kristin E. Espinosa. 1997. "What’s Driving Mexico-U.S. Migration? A Theoretical Empirical, and Policy Analysis." American Journal of Sociology. 102: pp. 4 939-999. Palloni, Alberto, Mike Spittel and Miguel Ceballos. 1999. Using Kin Data to Falsify Social Networking Hypotheses in Migration. Paper presented at the annual meeting of the Population Association of America. 33 In 1998, INS raids in Georgia caused the illegal workers picking Vidalia onions to flee. By the end of the week, both of the state’s senators and three representatives sent a scathing letter to the Attorney General protesting, "the lack of regard for farmers." In 1999, when the INS focused on meat-packing plants in Nebraska, the political reaction was very similar and the INS again stopped its enforcement efforts.